A Dragon’s Story is NextGen Gaming’s latest and the best online slot machine. NextGen Gaming is an Australian game developer responsible for many of Pokies.com’s most popular games, like Foxin’ Wins and Foxin’ Wins Again. NextGen’s latest game is A Dragon’s Story, which follows the story of Ruff the Mighty Dragon. Like all dragons, Ruff is a hoarder who loves treasures, gold and jewels. You take on the role of a brave knight who would like to free Ruff of the burden of owning too many treasures. 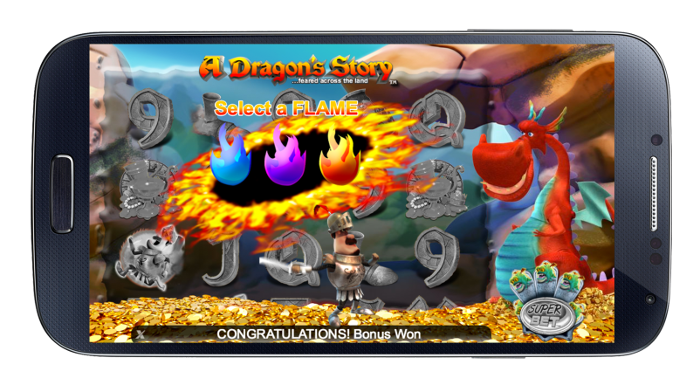 A Dragon’s Story is a 5 reel, 25 line video slot game (or “pokie” as the Aussies of NextGen calls its games) which features fantastic visuals, fun-filled gameplay (by which we mean “you can win A LOT of free spins”) and NextGen staples Whiz-By and SuperBet. The latter allows you to increase your bets in exchange for more wild symbols on the reels. Don’t take our word on the fantastic visuals, check the game out yourself (btw, the game looks exactly the same on your computer and mobile devices, like Android phones and tablets and iPad & iPhone). If you are already a member, sign in to play A Dragon’s Story. If you are new to Pokies.com online casino, you can play the game with your free $5 (no deposit required! ).